As ever on New Year’ Day, I have tried to list twelve things that I bring with me into the new year, from the year that just ended. Twelve special moments marking my 2017. It was the year when the path towards greater European unity restarted. I have two images in mind. First, the sixtieth anniversary of our Union, on March 25th in Rome: not just a ceremony to celebrate the past, but a practical commitment to relaunch and strengthen the European Union, together (I wrote about it here). We started with the Europe of defence: after months of hard work, last December I announced the launch of a Permanent Structured Cooperation on defence. It is a dream of our founders coming true, together with a package of measures including a European Defence Fund and stronger cooperation with NATO (I explained everything at the European Parliament, here). It is a way to be more efficient and autonomous, as Europeans, also in the field of defence. And to become a more reliable point of reference for our global partners. One moment to sum up thousands of stories: last November in Abidjan, Ivory Coast, we held the first summit between the European Union and the African Union, with the Prime Ministers of our countries. It was the sign that our partnership has become a priority, and that our cooperation spans across all sectors. This includes our common work to save the lives of migrants, together. In the previous months we had already launched the largest ever investment plan for Africa. And thanks to our work in 2017, together with the International Organisation for Migration, we had already started to help migrants go back home from the detention centres in Libya, in a voluntary and assisted way. In Abidjan the African Union joined our work, as we set up a joint task force of the European Union, the African Union and the United Nations. Tens of thousands of people have gone home, with practical help to build a new life. Thousands of lives were saved and changed thanks to our cooperation. It was not an easy year in the Balkans. I visited the six capitals of the region in one of the most difficult moments – in some cases, a moment of deep political crisis (I wrote about that trip here). Today, thanks to bold decisions and to some great work we did together, those crises have been addressed and mostly solved. The path towards reforms has restarted (although there is still much work to do) and the compass of European integration is showing the way. 2018 will be a crucial year, to consolidate and make this path irreversible. 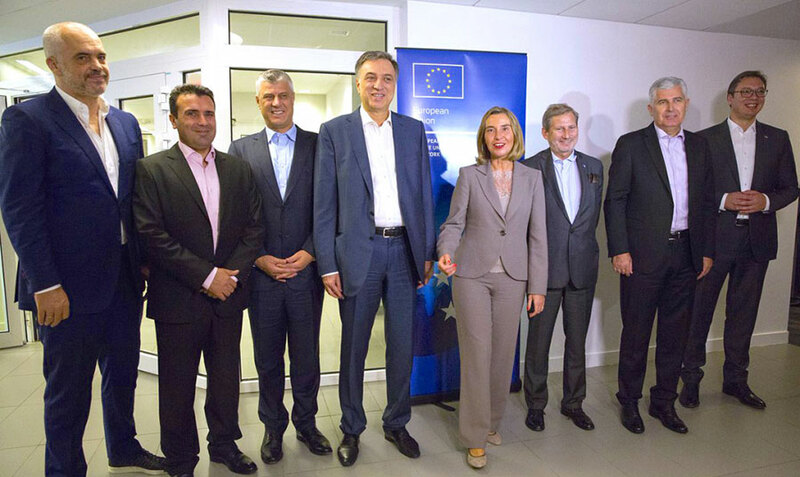 It would be an important result not only for the region, but for the whole of Europe. This year the foundations of multilateralism and the United Nations’ system were questioned. The European Union has become the indispensable pillar that supports international law, multilateral diplomacy and the whole UN system. 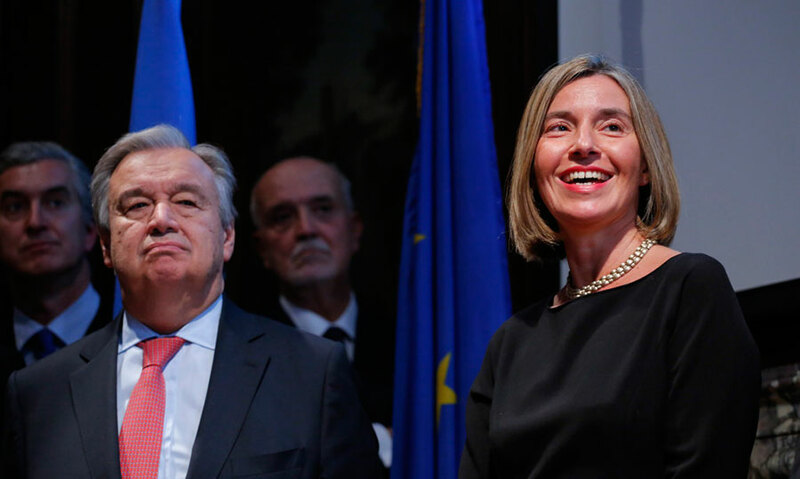 For this reason this year I spent Europe day – May 9th, the day we celebrate our unity – in New York, at the Security Council and then with Secretary General Antonio Guterres. It was a simple gesture to show our lasting support to the UN agencies and the UN Charter’s principles, and to make clear that our partnership will remain essential for us Europeans. The world knows it can always count of the European Union’s support as a reliable partner and a constant reference point. A difficult moment for multilateralism came after President Trump’s decision not to certify again the nuclear deal with Iran in the US Congress (this was my press conference after the announcement). At the UN General Assembly’s Ministerial week, last September, I chaired the meeting of the countries who had negotiated the deal. In that occasion, we acknowledged once again that Iran is implementing the deal, as certified nine times by the International Atomic Energy Agency. The European Union – as a multilateral and reliable power – will continue to work for the deal to be implemented by all sides. For the first time in over twenty years an Israeli Prime Minister came to visit the European institutions. In those December days the attention was focused on President Trump’s announcement on moving the US Embassy to Jerusalem. 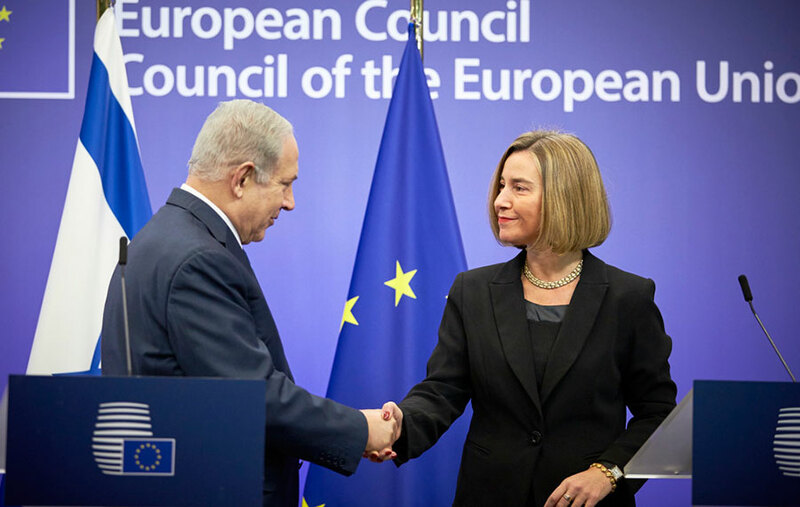 The European response was clear and united: we believe that the only realistic and sustainable solution is for Jerusalem to be the capital of two States – West Jerusalem for the State of Israel, East Jerusalem for the State of Palestine. All together, with the 28 EU Foreign Ministers, we told this once again to Benjamin Netanyahu during our meeting in Brussels. On this basis we are ready to help the sides restart negotiations, together with the Quartet and our Arab partners – using our “convening power” to help all relevant actors sit at the same table. It is not by change that, in the same days, both the Jordanian Foreign Minister Ayman al Safadi and Retno Marsudi – the Foreign Minister of Indonesia, the largest Muslim majority country in the world – came to Brussels to talk about the status of Jerusalem. Once again, our Union is an important point of reference for our global partners. A sunny day on the deck of the San Giusto ship, in Malta’s harbour. It was the setting for the graduation ceremony of the first ninety Libyan coastguards trained by our Operation Sophia. Until last year, thousands of people were dying in Libyan territorial waters, where our ships cannot enter. Thanks to our cooperation with Libya the number of these tragedies has dropped. The work is still long to help Libya get security forces that are professional, well-equipped and respectful of human rights. But the path is the right one. Here is “Europe at sea”, a documentary film by Annalisa Piras: for two years she followed our work with operation Sophia to save lives and fight human trafficking. At the beginning of April we gathered in Brussels, together with the United Nations, the entire international community to work on the future of Syria and the region. The night before the conference marked one of the most tragic moments in the war: the chemical attack in the province of Idlib. When the world works for peace, the enemies of peace react with even greater violence. But in Brussels the international community, together, stated once again that peace in Syria can only come from political negotiations. And today we are working to put our convening power to the service of peace: we are reaching to actors that are sometimes very distant from one another, and yet all essential to allowing and accompanying a political transition to end the war in Syria. Next Spring we will host a second conference as part of a “Brussels’ process” for the future of Syria, to support the negotiations in Geneva. Last November we welcomed to Brussels our six partners from Eastern Europe – Ukraine, Georgia, Moldova, Armenia, Azerbaijan and Belarus – after a year of important achievements in our cooperation with each of them: for instance, visa liberalisation for Ukrainians and Georgians travelling to the European Union, or the Comprehensive and Enhanced Partnership Agreement with Armenia. In Brussels we agreed on twenty practical projects to achieve by 2020. Because this is the true meaning of our partnership: practical cooperation to truly improve the life of Europeans, all of them. Not just one moment, but so many of them: all my meetings this year with young people from Europe and the world. It is always good to listen to their ideas, their criticism, their proposals. It is good and it is essential. In many parts of the world more than half of the population is under-30: it is simply impossible to deliver on a country’s needs without their contribution and their energy. 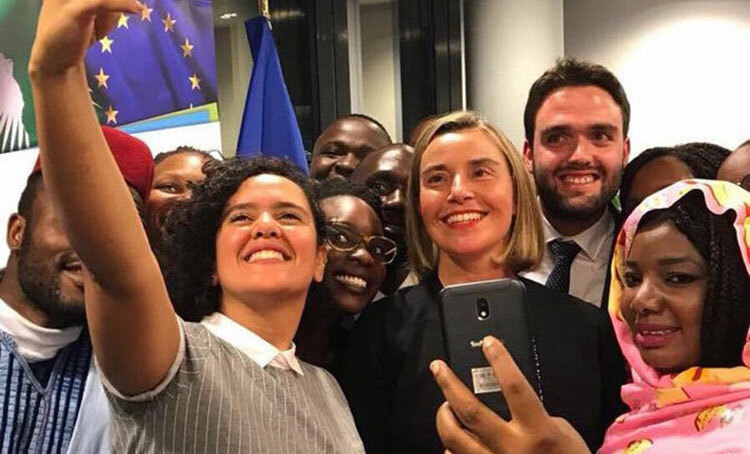 This is why we set up new channels and new opportunities for dialogue between the European institutions and young people from the EU, Eastern Europe, the Mediterranean, the Sahel, Africa and Asia. And we are now working to turn many of their proposals into practice, together. One of many visits to Asia this year: last November I was in Bangladesh, visiting the largest refugee camp hosting hundreds of thousand of Rohingyas who fled Myanmar. I met very young kids taking care of even younger children, women who suffered unspeakable violence. To help find an agreement, I met with the Prime Minister of Bangladesh, Sheikh Hasina, and the day after, in Myanmar, with State Counsellor Aung San Suu Kyi. We encouraged them to reach a deal, and the deal between Bangladesh and Myanmar came, a few days later. Turning it into practice will not be easy: our Asian partners know they can count on us to accompany this difficult process. A very young man and women who experienced war on their skin, as child soldiers. And who now look at the future of their country – Colombia – with confidence, in peace. I met them last February in Brussels, in one of so many moments of work on Latin America. Right after the peace deal between the Colombian government and the FARC, the European Union gave all its political and economic support to reconciliation and recovery in Colombia. When there is a need to invest in peace, our Union is always ready: a reliable power and a point of reference for all those working for peace, security and a truly sustainable development.